I took some photos for Monocle magazine. This is one of the photos they didn't use. 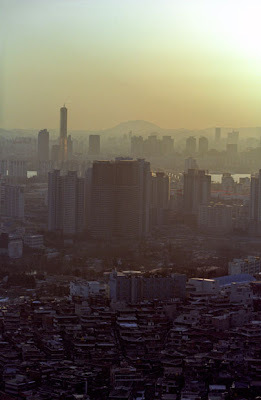 It is a picture looking south from Namsan, a small mountain in the center of Seoul. The tall building across the Han River is the 63 Building. Another photo I took called "Crosswalk in Jangandong, Seoul" will be part of the One Hour Photo exhibit from May 8 to June 6 at American University Museum at the Katzen Arts Center, Washington, D.C. Here is the schedule of artists.